he 1970's and 1980's had been hard decades for Parker, but although most people by now regarded the fountain pen a fossil, for Parker there was in particular one model that continued to sell in large numbers, the Parker "75", with its distinctive, yet simple design and functionality. And, at that, with a nib that could easily be replaced to suit the users hand. Especially the Cicelé finish (a pattern that Kenneth Parker once "borrowed" from a cigarette case in the early 1960's, made by a London silversmith) in sterling silver had sold in the thousands. But by 1990 the Parker "75" was closing in on its twentieth year, and it's high end cousin, the Parker Premier (that shared many finishes with the Parker "75") was soon to turn ten. Other high end pens, like the Classic, had been around since 1982 (even though it was slightly redesigned 1988 as the Parker "95"). Parker decided that it was time to retire the old work horses and launch a new top line fountain pen. 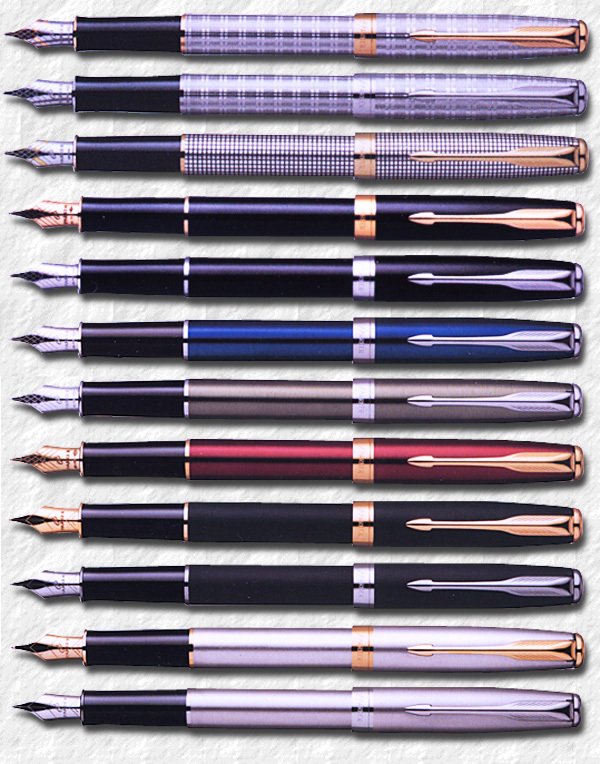 During the 1980's Parker had relied heavily on the Jotter for the low end ball pen market and the Classic for the high end ball pen and roller ball pen market. By the late 1980’s Parker felt that they needed to revitalise the $10 to $100 gift market and commissioned Hollington Associates in London to design a completely new ball pen and pencil. As a result of this The Insignia was introduced in 1991. The principle designer of the pen being Geoff Hollington. he new Insignia line was marketed as a precision-crafted, high-performance writing instrument based on an ergonomic design. As a top-line Parker it qualified to bear the Sterling Silver Cicelé pattern, and it was an instant success. Now Parker again contacted Geoff Hollington and asked him to come up with a fountain pen design that would be versatile and attractive enough to replace the Parker "75". Hollington worked closely with Parker's engineers to make sure space was efficiently used and that writing performance, cap fit, pushbutton action for the ball pen version and so on were optimised. His long experience with different materials and the knowledge of the basic construction of the pen, ABS plastics, acrylics, brass, stainless steel, silver and gold made the cooperation work well. — Pens are very, very simple products in some ways: the have rotational symmetry, their size is constrained by ergonomics, as is the shape to a large extent; they are very well evolved - the clip for instance works well in pockets and bags and it stops the pen rolling off the table. So when designing a pen you have only a small space in which to move. Add the need for strong brand authenticity and the space becomes very tight indeed. That’s why, in my opinion, properties like proportion, balance and elegance are very important, Hollington says. Fougére,Athenes, Chinese Laque Vision Foncé, Chinese Laque Ambre, Cicelé, Cascade Gold, Cascade Silver, Laque Indigo, Laque Moonbeam, Laque Firedance, Laque Solid Black, Dimonite G, Laque Autumn red, Laque Forest Green, Laque Midnight Blue, Matte Black, Flighter GT and Flighter CT.
— It always astonishes me how badly most pen products rate in these respects. We used to work and fight really hard to get a shape where the cap looked equally good on the front and back of the pen, where the step between cap and barrel was minimised or non-existent. In a product of this size, a tenth of a millimetre is worth worrying about! Geoff Hollington reveals. He explains that the Sonnet was intended to be ‘the classic Parker’, a truly timeless product, so he went for a really well proportioned cigar shape, clear but updated arrow clip, a generously sized nib and, from the engineers, state of the art writing performance. He of course later went on to design the price winning Parker "100" and the Frontier. The strategy was to offer the Sonnet in several designs, priced accordingly, so that one model could be offered in a wide price range. 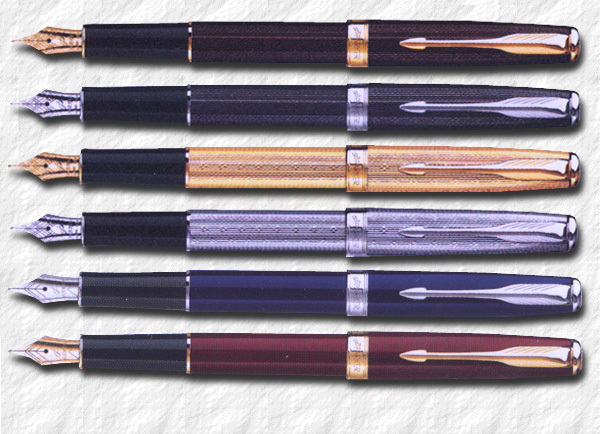 There were four different nib styles designed to be fitted on the different price ranges. The top line Sonnets had an 18K solid gold two-tone nib, highlighted with rhodium plating. The next level had engraved 18K solid gold nibs. The next price range had 23K gold plated stainless steel nibs and the cheapest Sonnets were fitted with Stainless steel nibs. Nib grades offered were: Extra Fine, Fine, Medium, Broad, Extra Broad and the customer could also order special nibs, such as oblique and italic versions. The Fougére was a silver patterned pen with gold filled trim. It had a broad cap band and was offered as a fountain pen, roller ball, ball pen and a 0.5 mechanical cap on- cap off pencil. It was fitted with the two-tone 18K solid gold rhodium nib. The very attractive pattern Athenes, that had previously been used on the Premier pens, had deep cut vertical engravings in a 23K gold plated body creating a pinstripe black laque effect. The trim was also 23K gold plating. This also had the two-tone solid gold and ruthenium nib and a broad cap band. The Chinese Laque Vision Foncé ind dark brown with 23K gold plated trim and a broad cap band. And the Chinese Laque Ambre, in light brown also with 23K gold plated trim and a broad cap band. The Sterling silver Cicelé, had the engraved solid gold nib, without the rhodium plating but also had gold plated trim and a thin gold band on the cap lip. The timeless Cicelé design would prove to be the most successful also among all the Sonnet models. The Sonnets new in 1998: Cicelé, Cascade Gold, Cascade Silver, Premier Blue Laque, Premier Green Laque, Premier Red Laque, Premier Solid Black Laque, Chinese Laque Red, Deep Blue Laque, Red Laque and Green Laque. Photography ©2012 by and courtesy of English Channel Collection. An unusual black laque Sonnet with a broad band and chrome trim. Cascade Silver in the same design. The next price level down saw the 14K Dimonite G a 23K specially goldplated pen in a striped design with a gold plated stainless steel nib. Flighter CT (chrome trim) which had the stainless steel nib, without the gold plating. 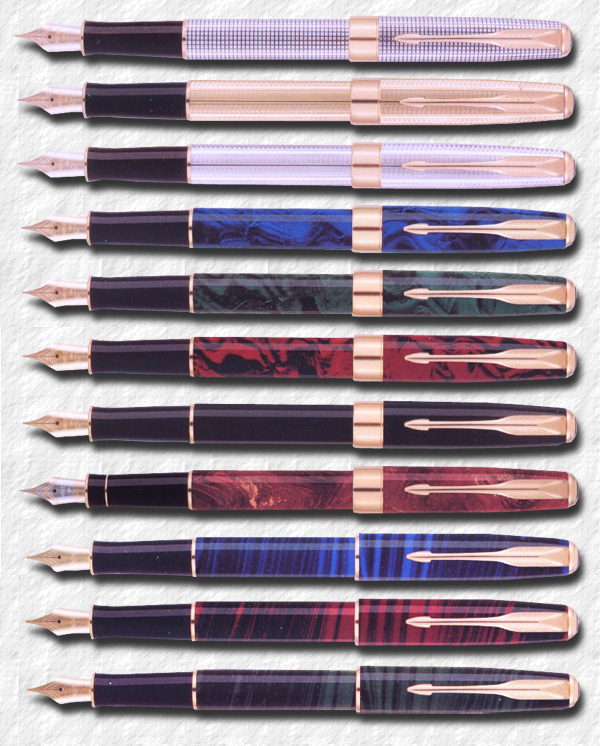 y 1998 the Laque Autumn red, Laque Forest Green and the Laque Midnight Blue were discontinued and Parker introduced a new "top-of-the-line", the Sonnet Premiere, which all had broad cap bands and engraved solid 18K gold nibs. 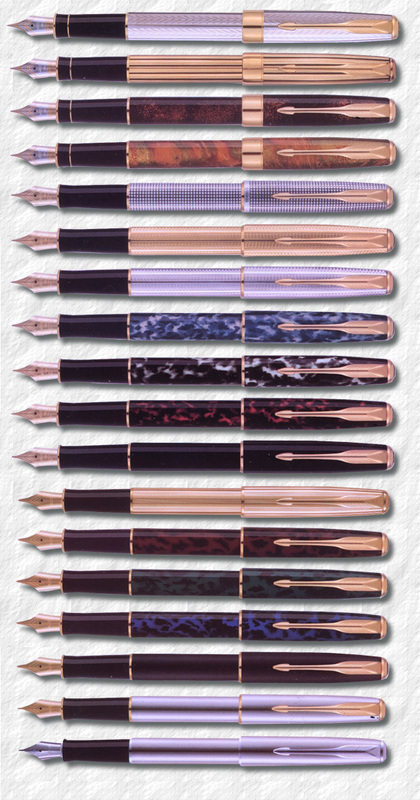 In 2001 the name Dimonite G was dropped and the gold plated pen was referred to only as 14K Gold plated. n 2003 the complete Sonnet line got a face lift and was reduced to 12 designs. The pens were now fitted with a flatter clip screw and the broad cap band now looked like it was made in two parts, fitted very closely. It also got the engraving "Parker". This must have been unsuccessful since it was discontinued within a year, making it the most illusive of the Sonnet designs. Dark Grey Laquer in a pronounced square pattern was introduced. Collectors are constantly looking for the Sonnet Cicelé, Fougére and Athenes designs, which sometimes fetch twice as much as the laquer designs. Even though some other designs are in fact much rarer. The Sonnet has proved itself as a worthy successor to the Parker "75", even though some pens have been known for having problems with the ink feed and drying out if left un-capped for some time. A problem that seems to affect the fine and extra fine nibs mostly, but still is problematic enough to give the model a bad reputation among collectors. A good pen should write as it comes off the production line and the nibs shouldn't have to be set after purchase for the pens to work properly. Well also pushing twenty years, it will be interesting to see if Parker is going to retire the Sonnet in a few years, in favour of a new top line design. A safe bet would be that this new pen also will be offered in the sterling silver Cicelé pattern. Cheap pens made in China might be good for bulk revenues, and as a super premium line, the Duofold Centennial models are excellent, but too expensive to find new writers. In my opinion Parker is losing the young customers and need to come up with a new high classed model, re-designed inside and out, but not based on any old winners. Parker needs a new conceptual "51", which will create a buzz and also write smoothly, always and forever. This to capture the publics eye and to bring the legacy of the true Parker penmanship forward into the future, or the Parker brand will die. Dare we hope for a new Hollington pen? The 2007 Parker Sonnet Monochrome. New Sonnets 2008: Chiselled Chocolate, Chiselled Carbon, Gold Lustre, Silver Lustre, Laque Deep Blue and Laque Deep Red. The 2010 Dark Grey Laquer Parker Sonnet.